Take the stress and mess out of hosting your own event! Create memorable experiences in our FUN, always PRIVATE, SAFE, CLEAN, tropical themed jungle that includes huge, FUN inflatables and active games. 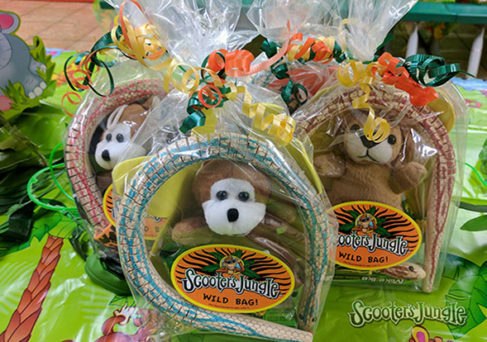 Enjoy jungle royalty treatment at Scooter’s Jungle when you LET US do IT for YOU! 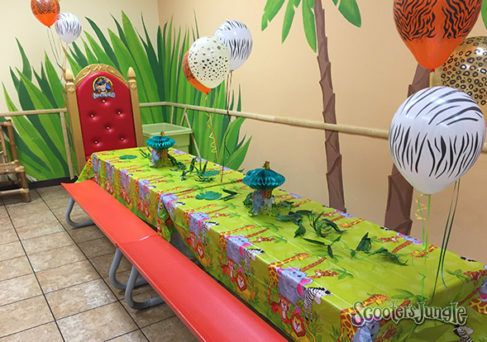 When booking with Scooter’s Jungle, expect to have all the work done for you so you can be present during your child’s birthday celebration. When booking with Scooter’s Jungle, we will always start you off with the ‘Base’ event. Upgrading to the other package options will occur when our party planner calls about 2-3 days prior to your event. This will allow you plenty of time to decide which package works best for your group when you have a better idea on how many attendees. Extra Guest charges: $5/adults, $10/kids plus large event fees may apply, please contact store for more information on extra guest charges and occupancy limits. You have the option of upgrading the 1-topping pizzas to specialty pizzas or adding additional toppings for a small fee per pizza. 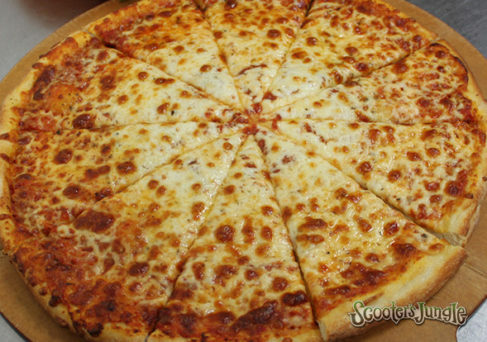 If your group size is larger than 25 guests, we suggest adding 1 additional pizza for every 5 guests. Parties with younger kids (ages 5 & under) and parties starting early AM (around 9:30am) or mid-day (around 2pm) will eat less food and should plan appropriately when ordering pizza. Chicken Tenders and Mini Corn Dogs are other food options that we offer and can be added to your event a-la-carte. You have the option of upgrading the 1-topping pizzas to specialty pizzas or adding additional toppings for a small fee per pizza. If your group size is larger than 35 guests, we suggest adding 1 additional pizza for every 5 guests. Parties with younger kids (ages 5 & under) and parties starting early AM (around 9:30am) or mid-day (around 2pm) will eat less food and should plan appropriately when ordering pizza. The ‘FUN’ Goodie Bags in this package can be upgraded to any other goodie bag / plush item as long as the net value is equal to the purchase of 22 ‘FUN’ bags or greater. 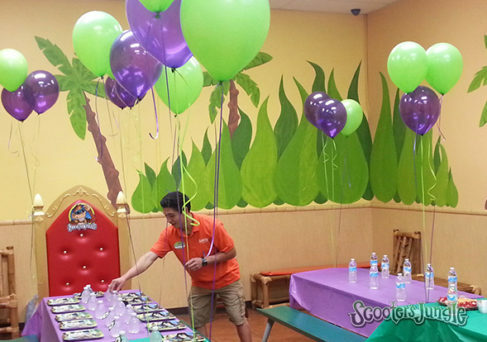 Package balloons can be upgraded to a larger quantity for a small fee to ensure each child goes home with a balloon. 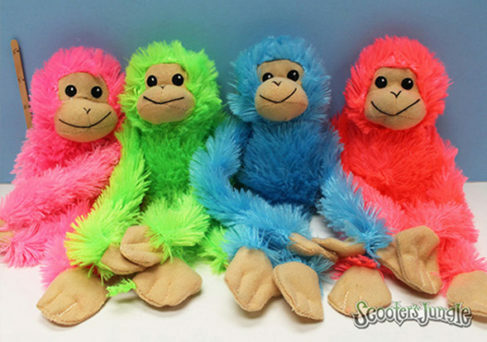 If you have 2 birthday kids, the option of ordering 2 Scooter Monkeys or 2 Memory T-shirts instead of one of each is also available. WeekEND Premium Parties: Saturday – Sunday: 11:00am – 5:00pm start times. Event date can be changed up to 10 days prior to event with $39 reschedule fee. $150 non-refundable deposit and signed reso agreement required to book (deposit is applied to final bill). Dining Room Staff gets Dining set-up Ready, Assists & Cleans it all up for You! Deal: Save $ Sunday 3/31/19, first day of Spring! Deal: Weekday Discount during spring break! 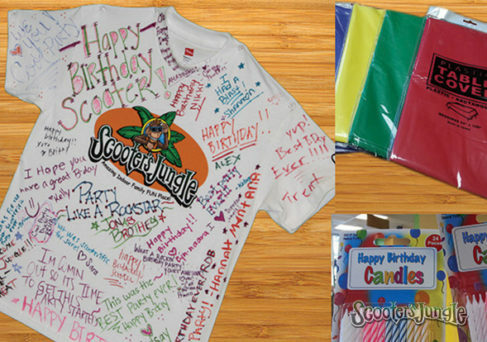 Cool Options you can customize your party with…save $ by upgrading to a package! Our awesome arenas give options for all ages! Choose which arena will best fit your birthday king or queen.